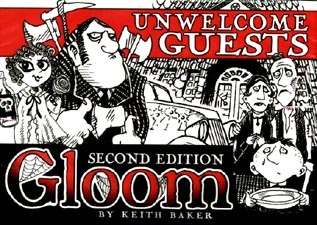 Unwelcome Guests is named for these undesirables, Characters who move from family to family during the game, with ruinous results. And it adds a horrid hoard of new Modifiers, Events and Untimely Deaths. The malodorous Malone mob brings another player to the table. When Boils Malone brought his family overseas to "get away from the heat", he didn't expect so much rain! Their Residence is included to use with the Unhappy Homes expansion. Requires the Gloom main game to play.